When it comes to your young ones, there is nothing you would not do to keep them happy and safe. You will get them admitted to the best school, you will buy them their favorite toys, you will cry with them when they are ill and laugh at their non-sensible jokes. We understand you want the best for your kids, so why compromise with their eye care? As per a report from Prevent Blindness, 21% of children aged between 6 to 72 months and 13% of children aged between 5 to 17 years suffer from farsightedness. The eye care of your children can be a more serious topic than you have imagined. With children spending more time on smartphones, it is obvious to cause digital strain to their beautiful eyes. Moreover, there are other serious issues to protect your little one's eye from beside eye injury and blurry vision. Tilting head or sitting too close to the TV. Unable to see objects at a distance. The kids usually complain of eye irritation or burning and even about blurry or double visions. If your child is haranguing you with all the details, it’s time to listen to them and fix an appointment with your ophthalmologist. Nearsightedness occurs due to refractive errors. It occurs when the shape of the eye is not able to refract light properly. In nearsightedness, your child will have a clear vision for objects near to them in distance but have difficulty in viewing objects that are far in distance. Also known as myopia, it is one of the common eye issues with children these days. Farsightedness also occurs due to refractive errors. In this condition, the child will have a clear vision for objects at distance but will face difficulty with objects near to them. The degree of your farsightedness affects your child’s focusing issue. It is also known as hyperopia. Amblyopia also named as “Lazy eye” is a condition of the eye where the eye fails to achieve normal visual sharpness. It usually begins in children during infancy and early childhood. Lazy eye often affects only one eye in an individual. The inherited disorders can also cause cataract in a child. The symptoms as whiteness in pupil and loss of vision are observed. It is suggested to take help from the ophthalmologist as soon the symptoms are noticed. There is no way you can keep your child away from the swimming pool when it’s summer and they just love to swim and spend their time in the pool. But this recreational activity will turn out to impact your young one’s eyes if proper measures are not taken during swimming. The water in most swimming pool contains a chemical called chlorine. It is known to cause dry eyes not only in kids but also to adults. Many have observed irritation, redness, and dryness in eyes after swimming. And all of this is caused by chlorine in water used in swimming pool. With easy access to technology, kids are seen driven towards smartphones. They spend hours playing games and watching videos on their phones. Probably, they are getting more device time than you are. The blue light emitted by the screen is harmful to the eyes and in long run can cause serious issues like loss of sight. Blurry vision, eye fatigue, eye dryness, difficulty in focusing are some other effects of digital strain. The fact that the pollution level is rising cannot be denied. The impact of pollution is hazardous. Many people are highly sensitive to polluted air. And kids are not an exception to it either. The dust particles can cause irritation and redness in the eyes. The children’s eyes must be protected from contaminated particles that are transferable to air. Extended exposure to sun’s UV rays results in eye damage. With kids involving in outdoor activities, their eyes are exposed to UV rays. The kids are prone to eye cataracts, and it may also increase the long-term risk of macular degeneration. As parents, your responsibility lies in protecting your kid and preventing their eyes from any potential harms. Here are a few measures that can help you protect your little one's eyes. If your kid loves to be outdoors and usually exposed to sunlight, it is best suitable for them to wear sunglasses. IZIPIZI #Sun glasses for Kids protect your eyes from UV rays and also are trendy and fun glasses for your kids to own. IZIPIZI glasses are super durable and highly functional against the UV rays. Since children are spending so much time on screen, it is best for them to use screen glasses like IZIPIZI #Screen that can filter the blue lights from the electronic screens. Of course, remind them to take breaks during long screen time to reduce the risk of digital strain. IZIPIZI glasses for kids are available at Cobalt International (Cobalt Bkk). 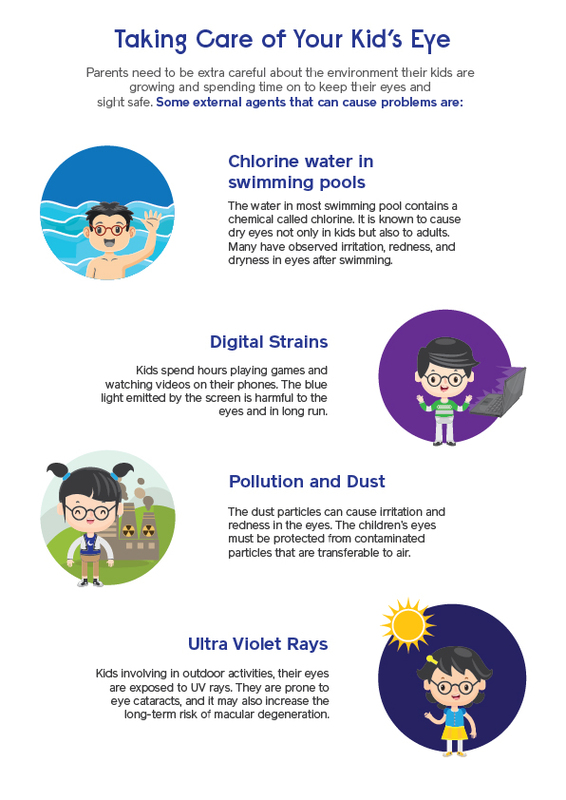 To prevent chlorine from entering your child’s eyes, it is suggested to use goggles while swimming. This also applies when kids insist on swimming in ponds or other water bodies. The goggles can protect your eyes from contamination. No one knows what it’s like to be a kid, except for the kids themselves. It’s bad enough your child has to wear glasses at such a tender age, but it would be even worse to know that they run the risk of injuring themselves if they fall with it. With IZIPIZI Kids sunglasses, parents wouldn't need to worry at all. IZIPIZI glasses are made from polycarbonate material, making it safe and durable for your kids. By taking a proactive measure for eye safety, you can prevent your child from any eye damages. In case of crucial cases, it is always suggested to visit the ophthalmologist at the soonest and agree upon the cure for the issue. But in most cases, we as parents can take actions to keep our young one’s eyes safe from both internal and external factor. We are obliged to keep them happy and their eyes safe. IZIPIZI #Sun and #Screen protection glasses for kids are easily available at Cobalt International (Cobalt BKK), Thailand.